» Houdini fisheye camera Matt Ebb . § 9 Responses to Houdini fisheye camera"
By the way, regarding the stereo spherical panorama, you can use the same technique for fisheye rendering as well. Which I in fact hope to commit to Cycles soon. I have a working patch missing only tiny review cleanups, in case you bother to ‘compare the results’, it would be nice to see if Blender/Cycles and Maya/Houdini are producing the same image distortions. Sure, have you got any code or formulas to point to? My name is Andrew Hazelden, and I’m one of the contributors to the Domemaster3D project. Your Houdini CVEX lens shader progress is really interesting. Would you mind if I use your fisheye_camera.otl file as the basis for porting the LatLongStereo shader to Mantra? Not at all! However you may want to check Matt Estela’s page (I linked to it above in the pose) since if I’m understanding what you’re talking about correctly, it’s already done. 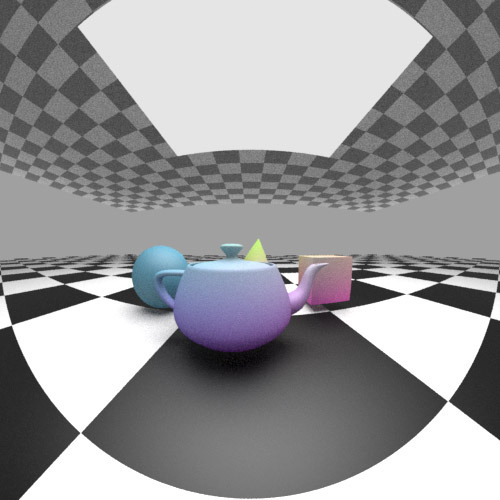 About the so called “equisolid shader” or stereographic projection etc. is it the same as using a 360 fisheye lens ???? The fisheye CVEX shader in the original post is not capable of what you want in your ‘little planet’ image, but in general it’s a similar technique. Just some slightly different math for the projection. You don’t need to first have a polar projection if you’re generating the projection yourself, just need do design the ‘lens’ to warp the rays to the correct directions. You are currently reading Houdini fisheye camera at Matt Ebb.